Glisten® Washer Magic® is a powerful, safe and versatile washing machine cleaner and deodorizer that helps extend the life and enhance the performance of your washer. 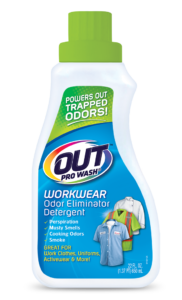 Glisten powerfully removes odor-causing residue and abrasive mineral buildup that reduces your washer’s cleaning effectiveness and damages clothing. Our multi-action liquid formula leaves no residue behind and effectively cleans door seals and detergent drawers, as well as hidden and hard-to-clean areas. Washer Magic contains no bleach or chemicals that can harm your washer or damage fabrics and is also Safer Choice certified by the EPA. Use monthly or as needed to keep your machine and laundry amazingly clean and fresh! Available in 12 fl oz or 24 fl oz sizes. 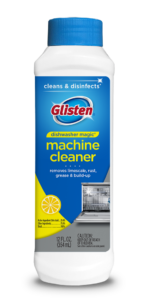 Glisten Washer Magic Machine Cleaner is made with natural ingredients*, providing a powerful yet safe clean. Glisten’s unique liquid formula is a powerful washing machine deodorizer, as it cleans the entire machine, including the seal, behind the tub and other areas where odors hide. Washer Magic is formulated without bleach or harsh chemicals and is machine and fabric safe. Glisten works in all washing machines and is plumbing and septic safe. How Often to Use: Use monthly or as needed to remove buildup, freshen, improve efficiency and increase machine lifespan. Non-Compatible Surfaces/Materials: Washer Magic is designed for use in all washing machine units. Works in all washing machines, including HE units. EPA/Safer Choice recognition does not constitute endorsement of this product. The Safer Choice logo signifies that the formula for this product, as Summit Brands has represented it to the EPA, contains ingredients with more positive human health and environmental characteristics than conventional products of the same type. 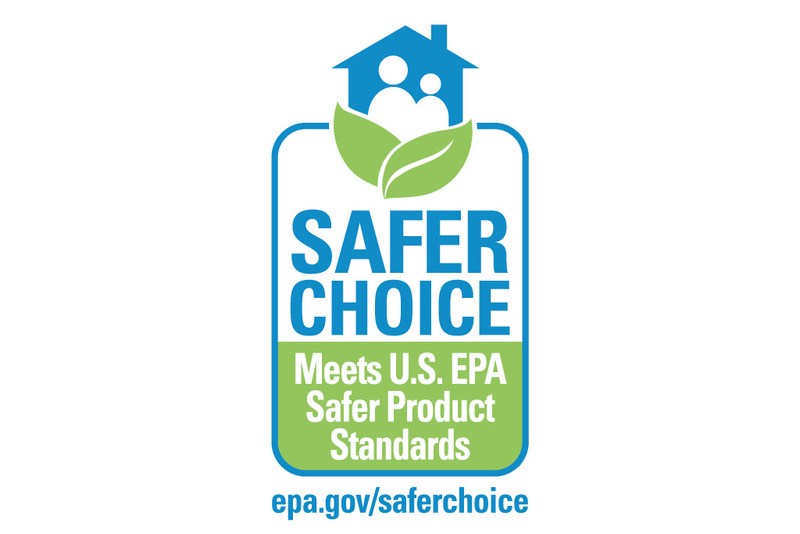 EPA/Safer Choice relies solely on Summit Brands, its integrity and good faith, for information on the composition, ingredients, and attributes of this product. EPA/Safer Choice has not independently identified, that is, via chemical analysis, the ingredients in the product formula, nor evaluated any of Summit Brands’ non-ingredient claims. EPA/Safer Choice provides its evaluation only as to the product’s human health and environmental characteristics, as specified in the Standard and based on currently available information and scientific understanding. This product worked great. The water coming out of my washer during the cleaning cycle looked like beef broth. I just did a test load and no more brown streaks. Read entire label before using. Do not add clothing or detergent when using Glisten. For heavily fouled washers, follow instructions below using half the bottle. Repeat as needed. Pour a small amount of Glisten onto a clean cloth. Wipe the rubber seal around the door until the residue is removed. Rinse thoroughly with a damp cloth. With machine empty, add 1/2 cup to detergent drawer (front loader) or directly into the washer tub (top loader). Run washer on “Normal” wash cycle with hot water setting. Repeat monthly or as needed to maintain a clean & fresh washer. 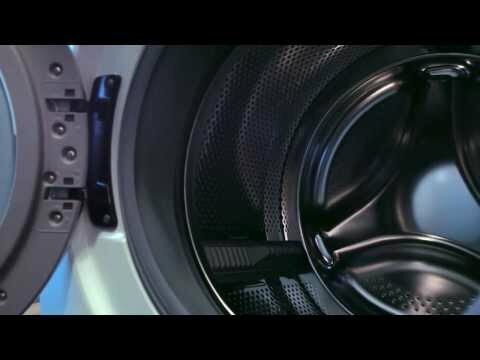 + What does Glisten® Washer Magic® do? Glisten® Washer Magic® is a powerful, safe and versatile washing machine cleaner. Glisten is specifically designed to remove odor-causing and abrasive mineral buildup that reduces machine effectiveness and damages clothing. The innovative multi-action formula works in all washing machines to clean, deodorize and provide lasting freshness. 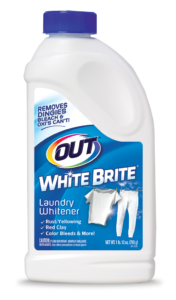 A Safer Choice certified product ensures no bleach or harsh chemicals to harm washer or damage fabrics. 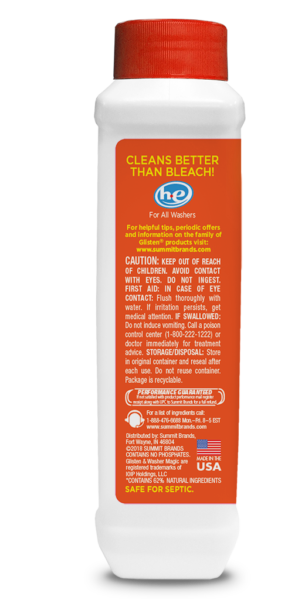 This most versatile liquid cleaner leaves no residue and effectively cleans door seals, detergent drawers, hidden and hard to clean areas. Regular use keeps your machine and laundry amazingly clean and fresh. + Why should I use Glisten in my washer? Minerals, detergent and soils can build up in your washtub, pump and hoses over time and reduce the ability of your washer to perform like it did when it was new. Mineral buildup can also cause odors and increase abrasion and wear on your clothing, resulting in clothes that are not as clean as they could be and wear out sooner. 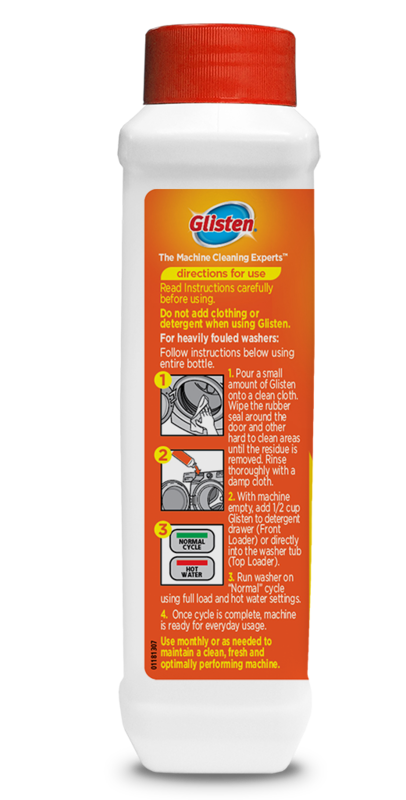 Regular Glisten use keeps your machine buildup free, smelling fresh, performing like new and lasting longer. + How does Glisten Washer Magic work? When circulated in the machine, Glisten increases the solubility of odor-causing residue and other buildup. The active ingredient contained in the solution then dissolves soap scum and mineral deposits that are left behind during the normal operation of the machine. After the buildup and deposits have been dissolved, they are flushed away by the normal rinsing cycle of the washer. At the end of the cycle, the machine is cleaned, freshened and maintained. A buildup free machine cleans more efficiently and lasts longer. + Where can I buy Glisten Washer Magic? + How do I use Glisten Washer Magic? Do not add clothing or detergent when using Glisten. For heavily fouled washers, follow instructions below using entire bottle. Pour a small amount of Glisten onto a clean cloth. Wipe the rubber seal around the door and other hard-to-clean areas until the residue is removed. Rinse thoroughly with a damp cloth. 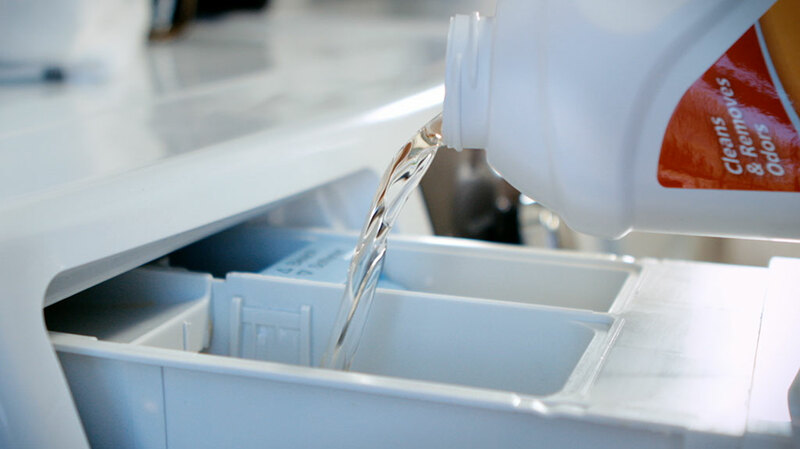 With machine empty, add 1/2 cup Glisten to detergent drawer (front loader) or directly into the washer tub (top loader). Run washer on Normal cycle using full load and hot water settings. Once cycle is complete, machine is ready for everyday usage. + What types of washing machines can I use Glisten Washer Magic in? Glisten Washer Magic is Safer Choice certified and is not formulated with harsh chemicals. Glisten washing machine deodorizer and cleaner is safe for use in all washing machines, including stainless steel and HE. Glisten is safe for all tub interiors, surfaces, detergent dispensers, machine components, plumbing and septic systems. + Is Glisten Washer Magic safe to use? 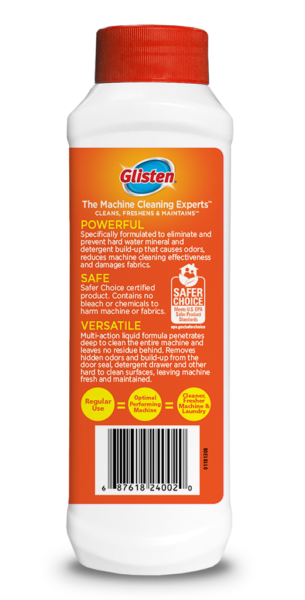 Glisten is Safer Choice certified, which ensures the formulation contains no bleach or other chemicals to harm the machine or fabrics. The machine rinse cycle fully rinses away Glisten, leaving no residue behind. + Can I use Glisten Washer Magic to clean other appliances? Washer Magic is designed and intended to clean, freshen and maintain washing machines only. + My washing machine still smells after using Glisten Washer Magic. What should I do? If you have a front-loading washer, try pouring a small amount of Glisten onto a clean cloth and wiping the rubber seal around the door. Rinse with a damp cloth. If excessive buildup has accumulated within the machine over time, additional applications or increasing the dosage of Washer Magic may be necessary to ensure all odor-causing buildup is removed. + What should I do if I spill Glisten Washer Magic? In the event of accidental spillage, clothing should be removed and rinsed in warm water and then washed with soap. If product comes in contact with skin, the affected area should be washed and rinsed with soap and water for 15 minutes. If irritation occurs, a physician should be contacted. As with all cleaning products, keep Washer Magic out of reach of children. + Does Washer Magic contain formaldehyde? Glisten Washer Magic does not contain formaldehyde. + How often should I use Glisten Washer Magic? 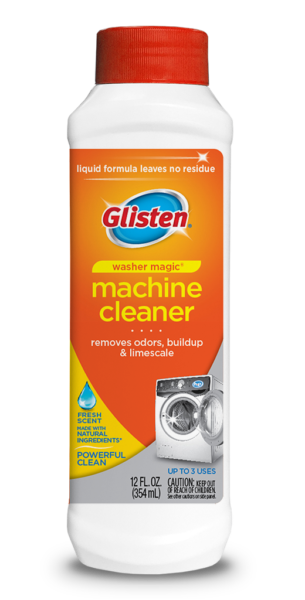 We recommend using Glisten Washer Magic once a month to remove odor-causing abrasive buildup, keep machine smelling fresh, improve machine efficiency and increase machine lifespan. + Do I need to rinse, wipe out or run an extra rinse cycle after using Washer Magic? Washer Magic is safe for use in all washing machines and will not leave any residue behind. Washer Magic cleans and removes odor-causing buildup and residue during the wash cycle and is fully rinsed away during the final rinse cycle. Once the cycle is complete, your washing machine is buildup free, freshened, maintained and ready for everyday use.